When it comes to taking your outdoor living space to an entirely new level, landscape edging may be exactly what the doctor ordered. 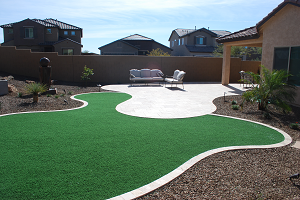 At Prestige Landscapes, serving residents of and near Phoenix, landscape edging is used to add balance and definition to the interweaving patterns that comprise our artful outdoor designs. Rick Silkey knows precisely how to use edging to transform a great landscape design into a work of transcendental beauty that perfectly accents the homeowner’s property, personality, and lifestyle. Imagine a yard or garden that is divided into asymmetrical “sections.” There may be a small group of colorful flowers arranged to comprise a circle at the center, while a row of bushes runs adjacent to a refreshing patch of cool, green grass. A sitting area faces a strip of native plants, arranged to simulate a winding path. Now imagine that these sections simply collide into one another, with no clear sense of boundary. It looks a little sloppy, doesn’t it? Landscape edging takes care of this problem. Landscape edging uses a variety of hardscape materials - brick, stones, wood, gravel, pavers - to define these areas and create crisp lines that make the sections look like parts of a unified whole. Landscape edging also serves practical purposes when done properly, directing people toward areas intended for foot traffic and isolating delicate plants, flowers, and soils. 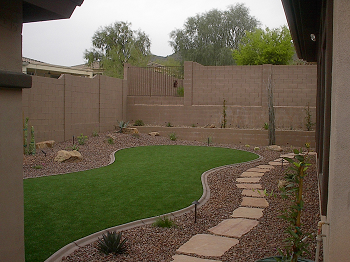 The wonderful thing about landscape edging is that it enhances the beauty of the landscape while not distracting from the true stars of the show: the colorful vegetation, the thematic touches, and the rock and patio features. It is integrated into the landscape subtly, while playing a role so important that if it were to be removed, the design concept would suffer for it. Rick Silkey selects edging materials that perfectly augment the landscape, ensuring that an overall sense of harmony is achieved. He uses only the highest-quality materials to ensure results that last for years while requiring little to no maintenance. He sets edging materials firmly in place so that you don’t have to worry about it becoming dislodged, leading to a sloppy, unfinished look to your outdoor space. Ultimately, he is all about quality, and you will appreciate his devotion to quality every time you gaze upon your beautiful lawn or garden. To learn more about landscape edging and how it can be used to transform your lawn or garden, please contact Prestige Landscapes today.